To celebrate the Jewish New Year, 5774, I baked ITJB's Honey Whole Wheat Challah in a round braid, as is traditional for Rosh Hashana. Wishing everyone a very happy, healthy, sweet, peaceful, and prosperous New Year! In the first photo you can see the indentations from my "poke" test to be sure it was ready for the oven. I didn't use any seeds because my kids prefer their Challah plain. I know what you mean about whole wheat vs. traditional challah. I've owned Inside the Jewish Bakery for many months, yet this is the first recipe I've tried. I'll take a picture when we cut into tonight and let you know about the crumb. In this recipe, whole wheat flour makes up 40% of the total weight of the flour (the other 60% is bread flour). I'm anticipating this challah will also be less sweet than traditional, since the baker's percentage of the honey is 7%, while in a traditonal challah the granulated sugar would be 10%-20%. 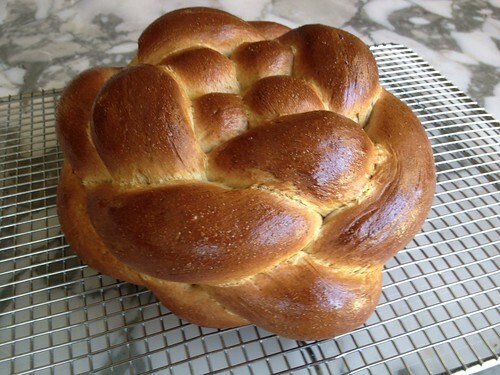 I don't know how "light and fluffy" it is, but it certainly has the texture of challah. The flavor is pronounced whole wheat. I really don't detect much honey or sweetness. 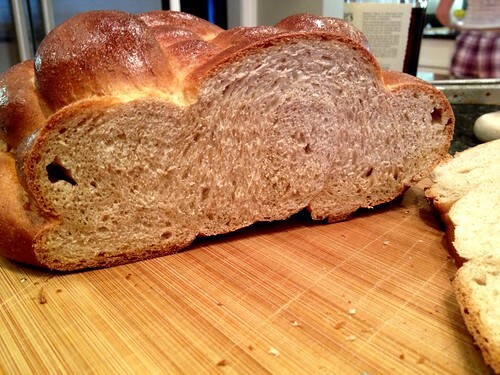 So if you like earthy, whole wheat flavor I believe you'll like this challah. Rosh Hashanah Challah for sure! I was going to make a one but at the last minute decide to make a traditional one when i found some saffron. That is the recipe I used... yours looks so much better... very good taste for toast or with dinner... lovely! How did you do the braid? You're very kind Varda. 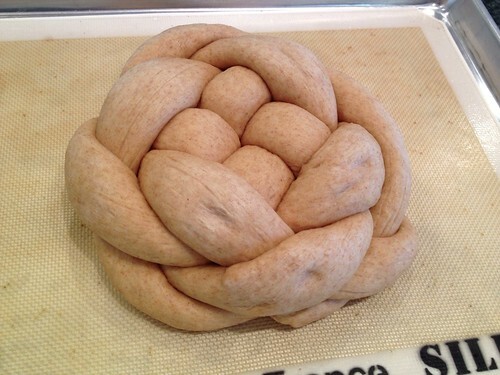 I divide the dough into four strands that I roll into ropes about 18 inches long. I lay two vertically and the other two horizontally over them, weaving the strands as you would a basket. Then I braid the ends until I run out of length. I fold and pinch the ends underneath. Is that a tic-tac-toe braid? with 6 strands. Very easy and no problem to remember how to do it. 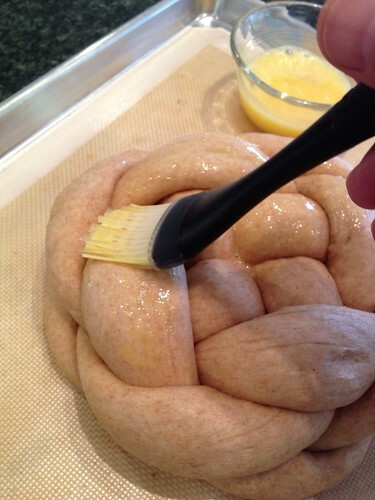 Yes Varda, that's how I braided my challah except I folded the ends under rather than bringing them over the top and flipping the loaf. It's much easier than the final product might suggest. Le Shonah Tovah to you and yours! Same to you and your family David.